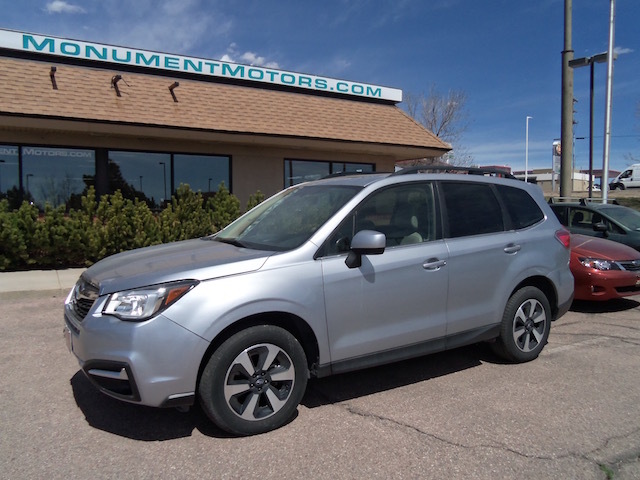 2017 SUBARU Forester 2.5i Limited Edition at Monument Motors, your source for used Subaru Foresters near Colorado Springs, Castle Rock & Denver. No Hail Damage. One owner, low mileage vehicle. * SUBARU Forester 2.5i Limited with CVT automatic transmission, Blind-Spot Detection with Lane Change Assist & Rear Cross-Traffic Alert, power Moonroof, Back-Up Camera, Power Tailgate with memory, heated light gray Leather seats, heated mirrors & windshield, X-MODE with Hill Descent Control, VDC stability system, Traction Control, Bluetooth, STARLINK system, premium am/fm/satellite/MP3/WMA stereo with color LCD display & CD player, auxiliary jack & USB port, frontal airbags, side-impact & side-curtain airbags, driver knee airbag, exterior auto-dimming mirrors with approach lighting, 17″alloy wheels, premium Yokohama tires, remote keyless entry, alarm, automatic climate control, power seat, rear-seat recline, auto-dimming mirror with compass, cabin air filtration, fog lights, rear privacy glass, rear bumper cover, roof rails and rear spoiler. (The original Factory MSRP on this loaded Forester 2.5i Limited was approximately $30,000.) This Subaru qualifies for a 5year or +100,000mile Extended Service Plan at an additional cost.